So You Think You’re Literate? So did I until I delved into Vegetable Literacy by Deborah Madison. She’s a long-standing advocate of buying local and cooking seasonal produce. Although I bought the book in 2014, and have cooked from it since then, I only recently started reading it. 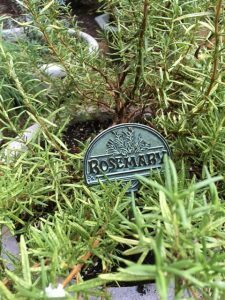 If you are interested in botany, gardening, cooking and/or eating, this book’s for you! The twelve chapters, each devoted to one vegetable family, includes essays, photos, and recipes. Just reading the chapter headings is an education—at least, it was for me. 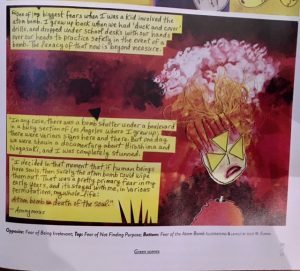 Chapter One: The Carrot Family. 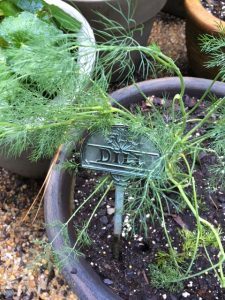 I once felt rather smug, knowing that Queen Anne’s lace is related to carrots. Ha! 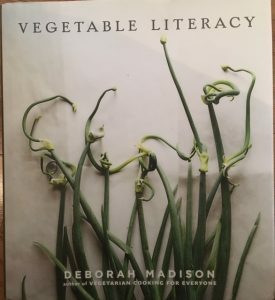 In this 43-page chapter, Madison introduces the rest of the family: angelica, anise, asafetida, caraway, celery, celery root, chervil, cilantro and coriander, cumin, dill, fennel, hemlock, lovage, osha, parsley, parsley root, parsnips, and wild carrot. 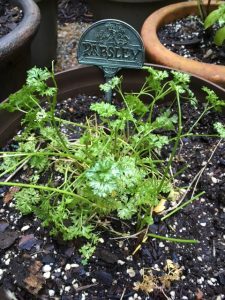 Although I’ve grown dill and parsley for decades, I never tumbled to the relationship. 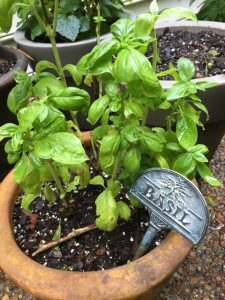 In Chapter Two: The Mint Family, I learned that most staples of my herb garden are relatives: basil, lavender, marjoram, mint, oregano, rosemary, sage, and thyme. 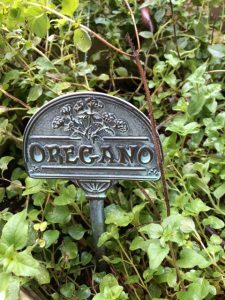 Thyme, sage, rosemary, oregano, and mint are all perennial for me. The problem with mint is that it won’t stay potted! 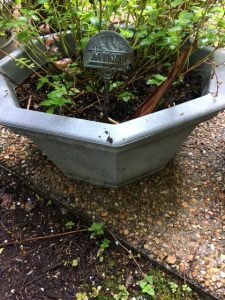 It’s been known to actually cross the patio. 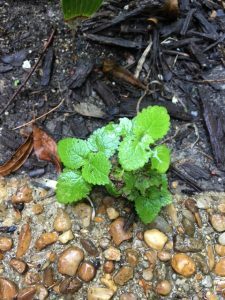 Thanks to this chapter, I now know that anise hyssop, bee balm, catmint, chia seeds, horehound, lemon balm, perilla, and savory are in this family as well. Unfortunately, my hyssop isn’t anise hyssop. Only bees want to sample it. 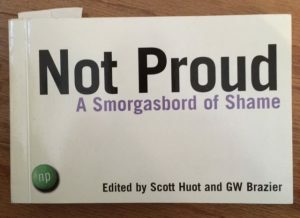 I won’t go in depth with chapter contents, for that wouldn’t do the book justice. I’ll just mention selections. 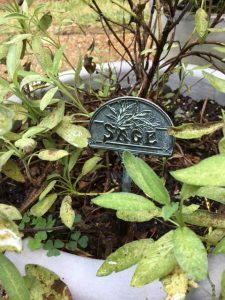 Chapter Three: The Sunflower Family, surprised me by including lettuces and tarragon. The Knotweed Family includes a favorite from childhood, rhubarb. The Cabbage Family includes kale, mustard, radishes, and turnips. Tuscan Kale with Anchovy-Garlic Dressing is a recent favorite. 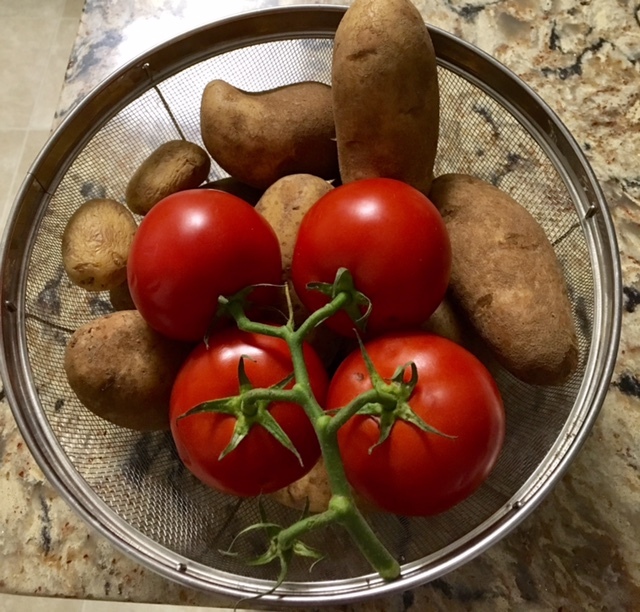 By Chapter Six: The Nightshade Family, I stopped being surprised that eggplants, tomatoes, potatoes, and tobacco might turn up together—along with miscellaneous other relatives. 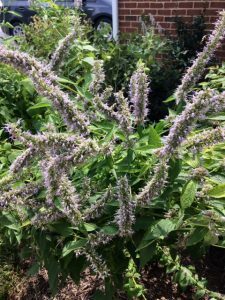 Chapter Seven (The Goosefoot and Amaranth Families) deals with edible weeds, leaves, and seeds. 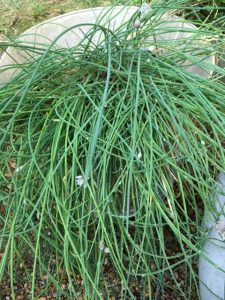 Chapter Eight includes the recipes for chives, onions, asparagus, leeks, shallots, etc. Of course there are chapters on squashes, melons, and gourds—which includes cucumbers; grains and cereals (e.g., barley, wild rice, millet, etc. 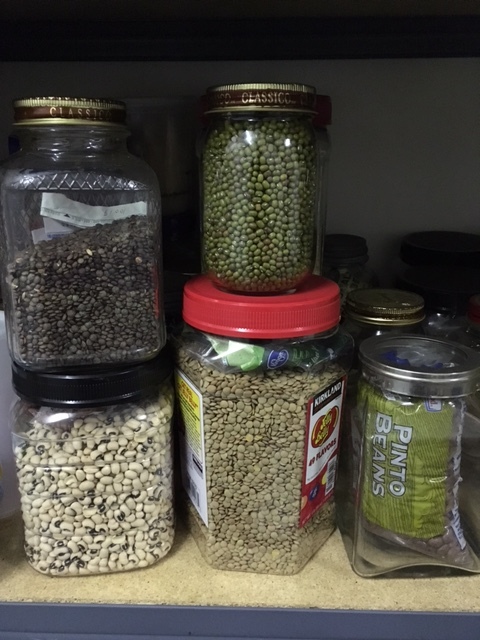 ); and legumes (all sorts of beans and peas). Chapter 12 is the last—shortest—chapter, on The Morning Glory Family. It’s shortest because the only edible member is the sweet potato. 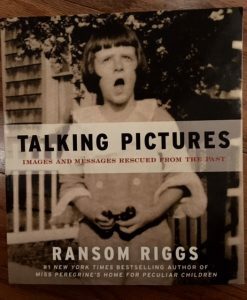 Last Saturday, August 19, was World Picture Day—and I missed it! But it’s never to late to recall a good idea. 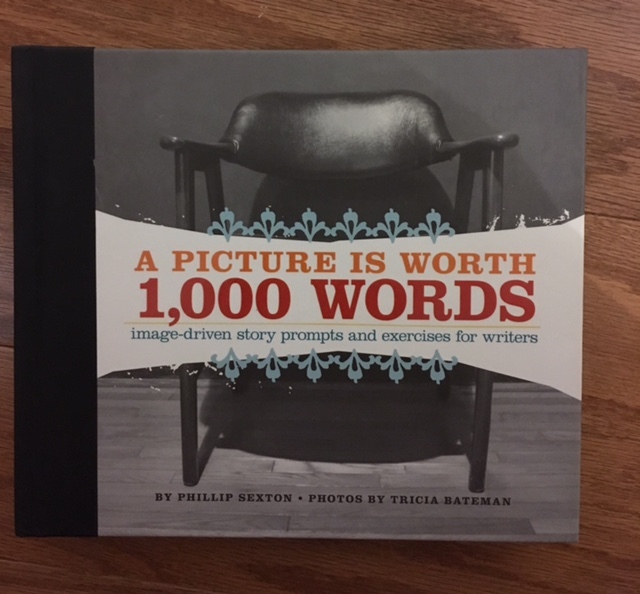 Those of us who have taken writing workshops know the value of pictures as writing prompts. 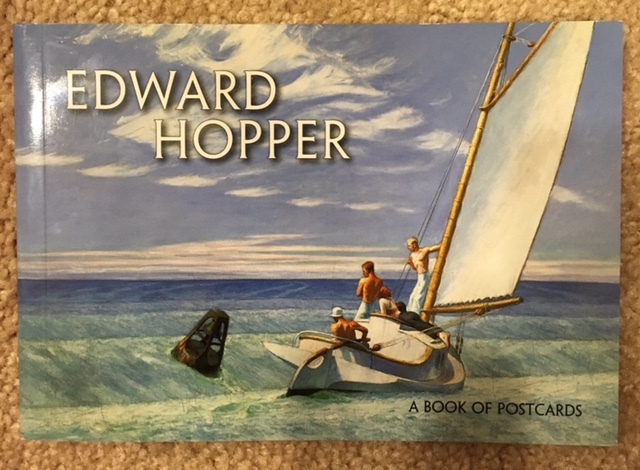 I’ve been on the receiving end and the giving end of postcards, photos, or paintings as the stimulus for stories. 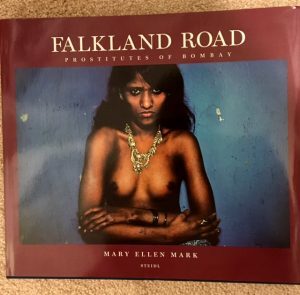 Several of my published stories started with such prompts, including Naked Truth, Love Me Tender, and Pictures Not Displayed (forthcoming). Whole books have been published for the specific purpose of prompting stories. 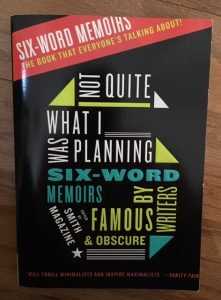 There’s a lot to be said for using such a book for daily—or at least regular—writing exercises, some of which turn into scenes in longer pieces or books. They can add a plot twist that surprises the reader. 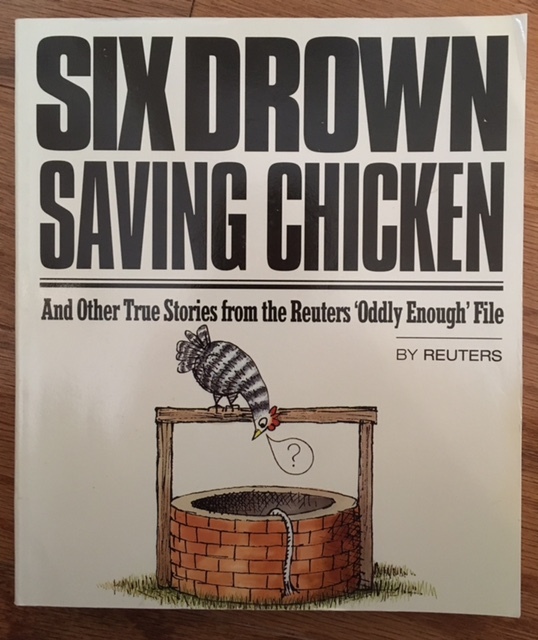 Books that aren’t necessarily intended as writing prompts can nevertheless be great resources. 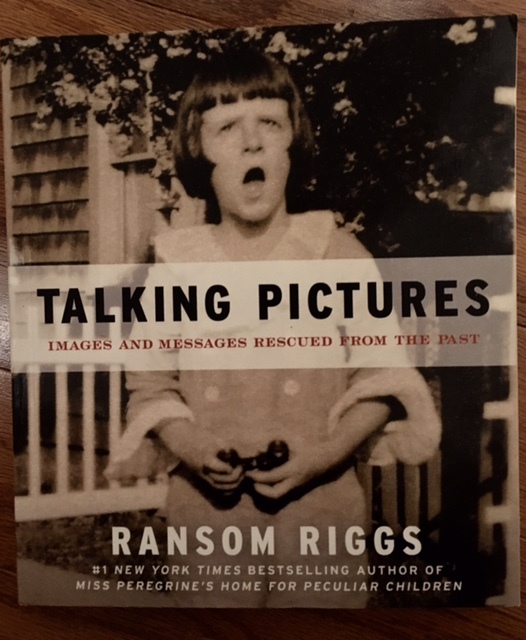 Each picture should lead to a full story, including—at the minimum—who, what, when, where, and why. Never underestimate the importance of why. Rorschach cards are used to elicit such stories for diagnostic purposes. And as with the Rorschach cards, the good writer will consider what led up to the picture, what will happen now, and what is the protagonist thinking and feeling. But beyond looking at pictures, you should take pictures. This is often easy, given the availability of cell phones with a photo capability. 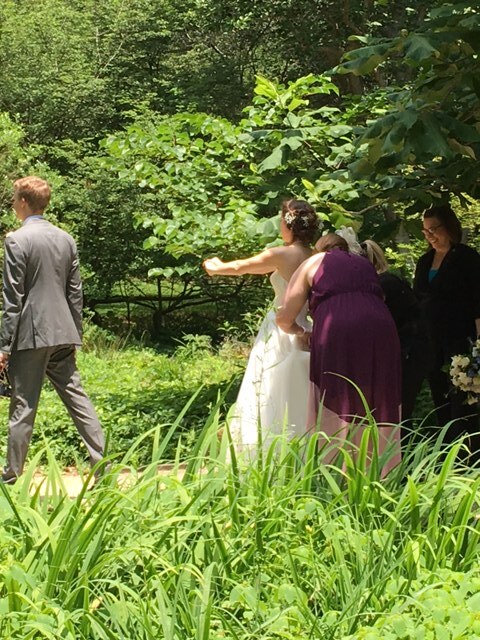 Keeping an eye out for photo opps makes you more sensitive to details of your surroundings—from the color of flowers to found art—to capturing people’s emotions in the moment. 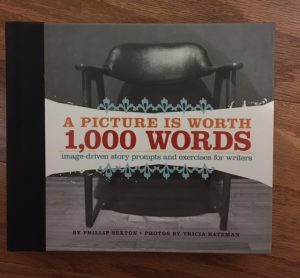 Your own pictures are as useful for material as any others. Go for it. I usually pitch all the “stuff” that comes with the newspaper without a second glance. But not this time! The August/September issue of Discover Richmond is a treasure trove for readers and writers! 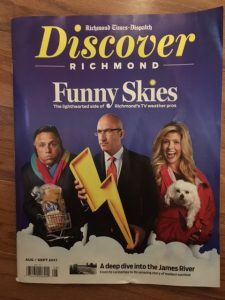 The cover story, about Richmond’s TV weather forecasters, is amusing. But—for me—the other articles are better. Anyone interested in off-beat information would agree. For example, one segment of the “Archive Dive” is about a Reynolds Metals aluminum submarine. It was active in the 1960s and is now housed at the Science Museum of Virginia. 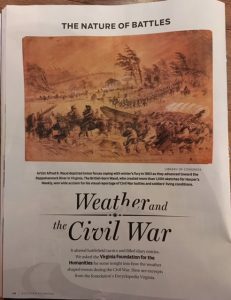 The long article on Gravel Hill is about a community in Henrico founded by freed slaves over 200 years ago. Another lengthy article describes five historic bells in Richmond: St. John’s Episcopal Church, the Carillon in Byrd Park, Centenary United Methodist Church, St. Paul’s Episcopal Church, and Capitol Square Bell Tower. Besides general interest, knowing about the bells, when and why they ring, would be great details for stories set in Richmond! 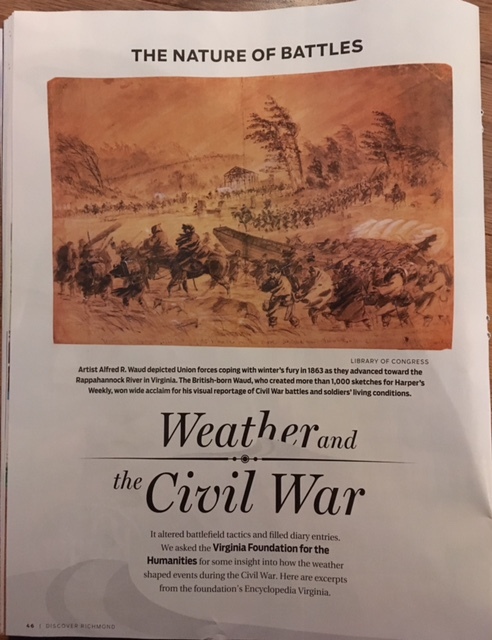 I recently wrote a short story mystery in which a lunar eclipse during the Civil War was a key element, so naturally I was taken with the article “Weather and the Civil War.” Naturally, the same weather could be a great obstacle or a helpful defense, depending on one’s objective. 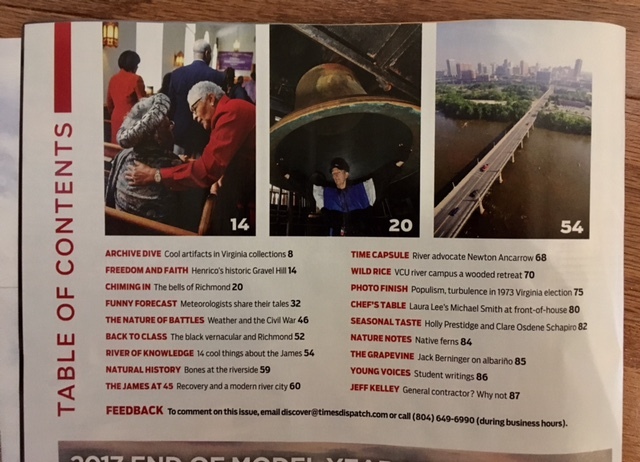 From articles on African American Vernacular English to the James River to the 1973 gubernatorial race, this issue of Discover Richmond is a treasure trove! If you haven’t read it already, do! 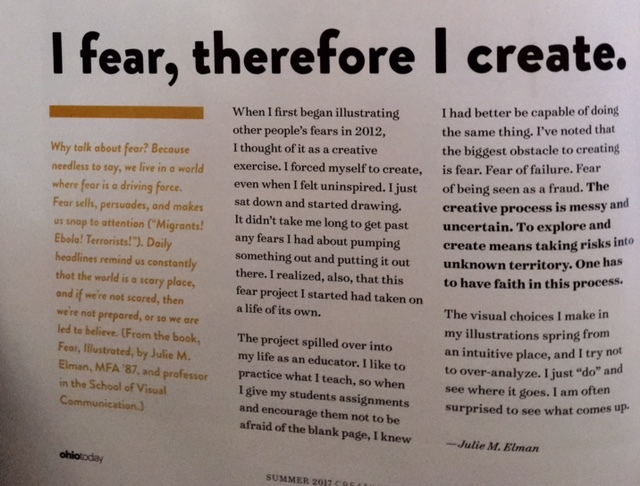 We are prone to assume that fear is a bad thing—but not so for writers! Giving your characters fears is just one more way to make them real. I’ve been on a character jag recently, writing about birth order, secrets, and exercises to better understand your characters and build realistic ones. 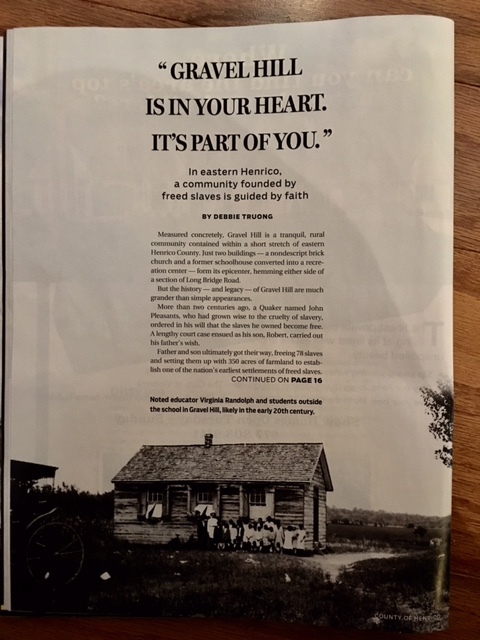 Lately it seems that everywhere I look I find another tidbit. 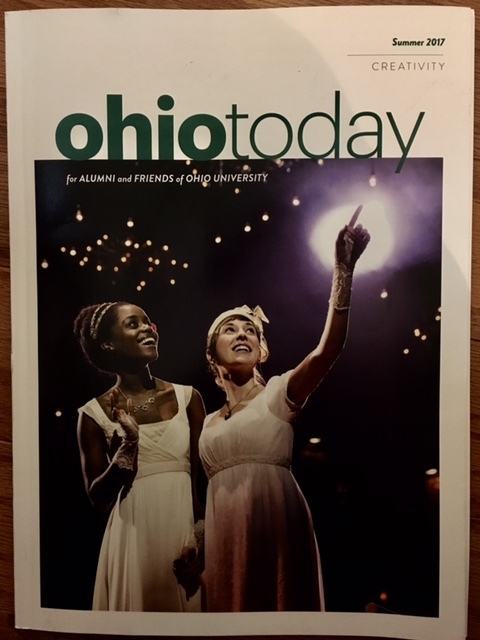 Such was my reaction to this article in the Ohio University alumni magazine. 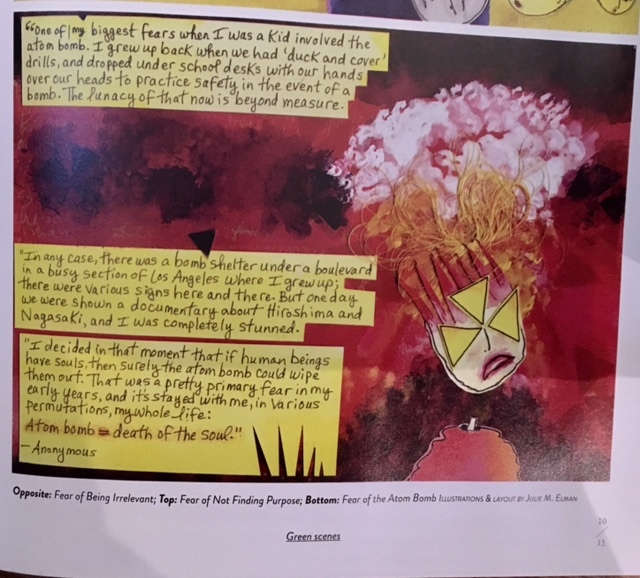 This half-page article is about the book Fear, illustrated by Julia Elman, a professor of visual communication. It is absolutely relevant to writers. 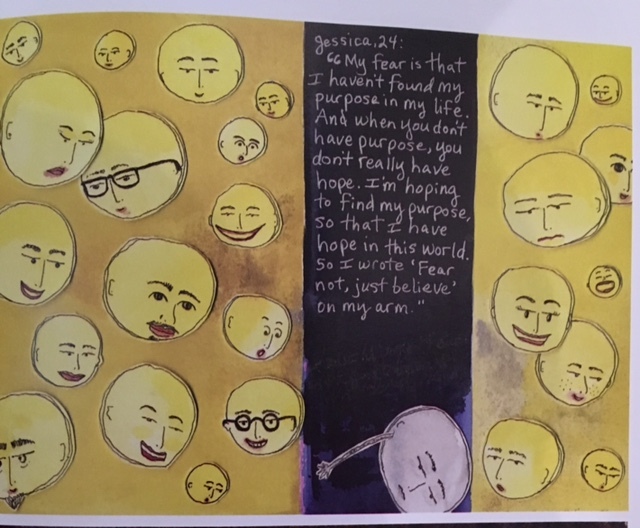 As Elman says, “…we live in a world where fear is a driving force. Fear sells, persuades, and makes us snap to attention.” I will add that giving your characters fears makes them more real. Your character’s fear could be a big one—in which case, it might be shared by many. The end of the world as we know it or other cataclysmic disaster is a staple in the action/adventure/suspense genre. More personal fears are more generally relevant to character building. Here, the prime example is fear of failure. But it could also be a fear of death or personal disaster that drives much of a character’s behavior, especially in the mystery genre. Personal fears can be anything, from a debilitating phobia to a source of humor. Consider the agoraphobic, so fearful of open spaces that s/he can’t leave the house. On the other hand, someone who fears insects could go to comic extremes to protect, home and garden. You get the idea. Bottom line: Give at least some of your characters fears that advance the plot. For more on creativity, see the Summer 2017 issue of ohio today. 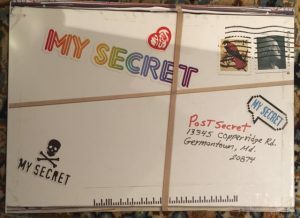 I recently wrote about the advantages of giving your characters secrets and of considering the effects of birth order. But how else do you really know your characters and make them richer? Finding books with titles like Building Better Characters is easy. Some such books include pages of questions to answer about your protagonist, everything from physical appearance to favorite foods to religion. My advice is to go beyond the usual. Here are six off-beat approaches to knowing your characters better. 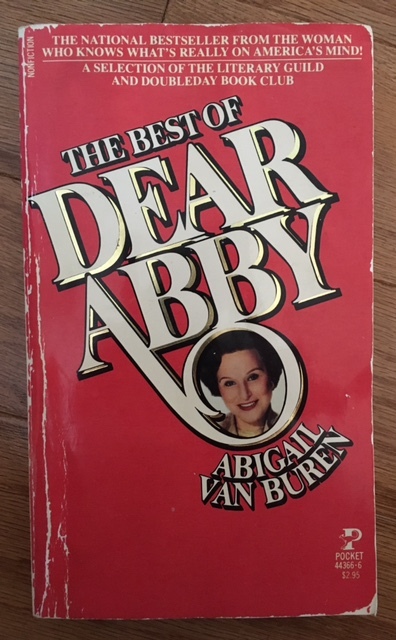 1) Write a letter from your character to an advice columnist of your choice. Make the advice requested relevant to your story. 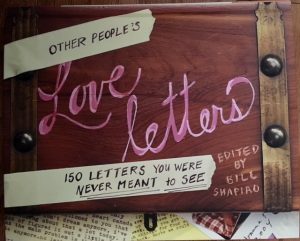 2) Write a love letter from your character to a real or ideal romantic interest. 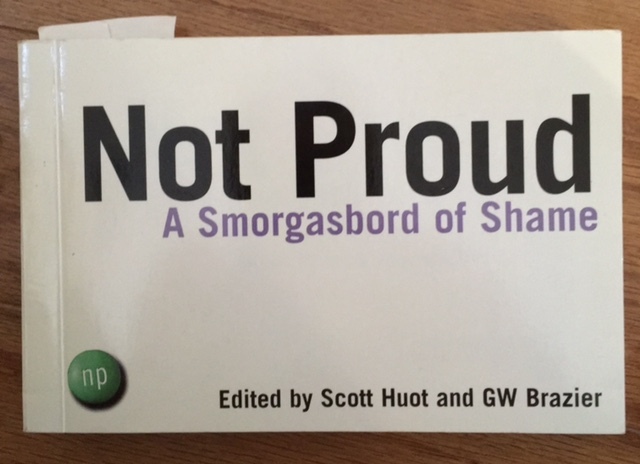 3) Imagine your character’s most shameful act or experience. If it’s out of character, create a believable context or circumstance. 4) Create a personals ad for your character. Strive for originality. 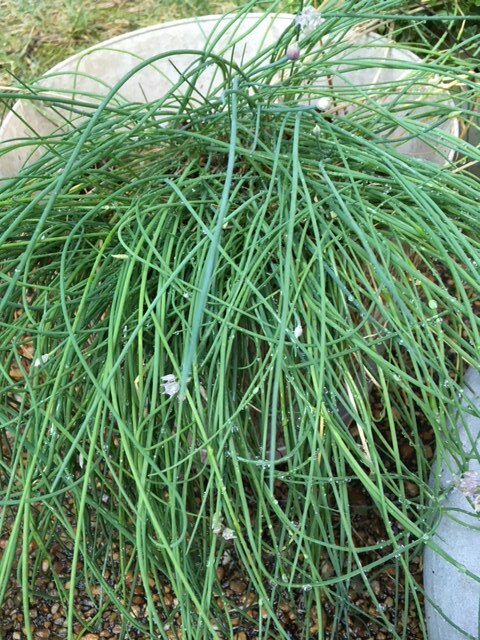 Include a picture. 5) Find a News-of-the-Weird story and write your character into it. 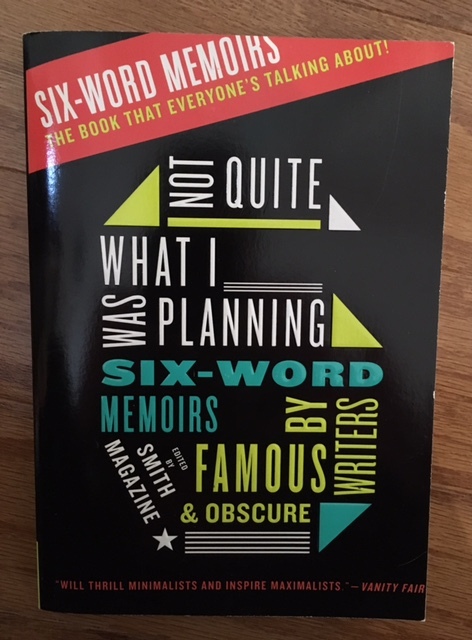 6) Write one or more six-word memoirs capturing the essentials of your character’s life. Last but not least: Write one or more of these bits into your actual story. 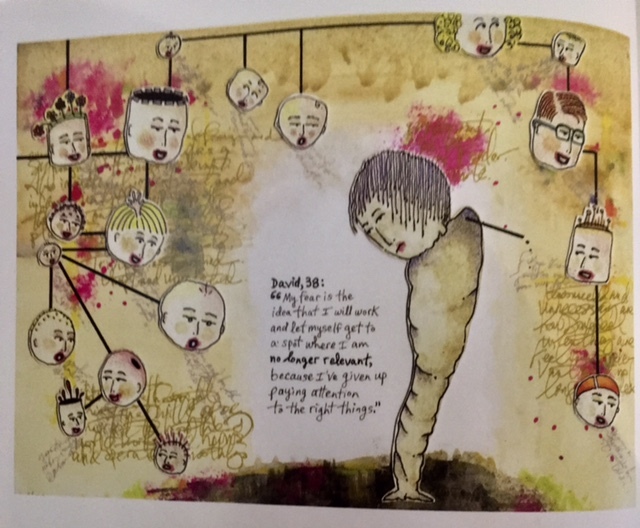 I recently wrote about birth order effects on personality, self-concept, and behavior. At the time, I made no distinctions based on the gender of the siblings. But last Sunday was Sister’s Day, so let’s take a look at female siblings in particular. 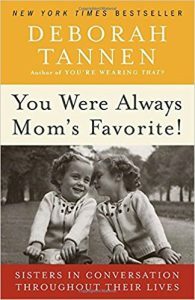 I’ve written before about Deborah Tannen, a world-renowned linguist who’s written—among other works—bestsellers about communication patterns between women and men, in the workplace, and between mothers and daughters. Now Tannen (the youngest of three sisters) has written You Were Always Mom’s Favorite! 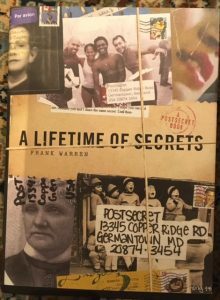 Sisters in Conversation Throughout Their Lives. 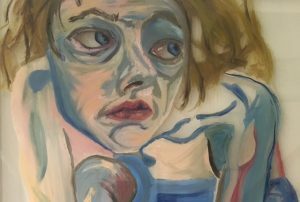 Tannen reveals that in some ways, she’ll always feel like the kid sister. She claims that just as mother/daughter relationships are particularly fraught because both are women, so are the relationships of sisters. 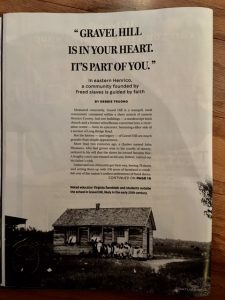 It is a relationship of connection and competition. Every child wants attention and resources. Age differences are a built-in power differential that lasts forever. Whether the siblings are 4 and 6 or 101 and 103, the older is always older. 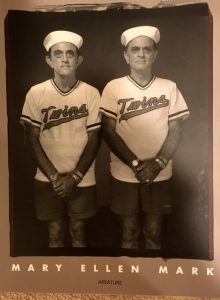 Twins are no exception. They often feel that people are trying to differentiate them as the smart one, the more outgoing one, the more studious one, the more athletic one, etc. Vikki Stark, author of My Sister, My Self: The Surprising Ways that Being an Older, Middle, Younger or Twin Shaped Your Life , focuses specifically on birth order among sisters. 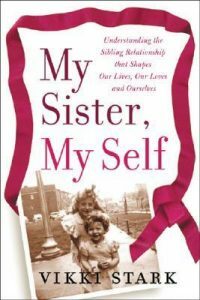 She maintains—and presents evidence—that birth order among sisters affects occupation, love relationships, friendships, and how one feels about her body. 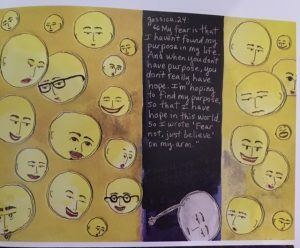 This book is by a social worker, and includes a lot of techniques and strategies to help readers who want to break out of limiting sisters roles or improve sister relationships. 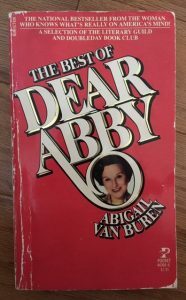 You can also go online and read articles like “Why the Sister-Sister Relationship Is Always Love-Hate” by Alicia Prince or “Sisters: love and rivalry” by Terri Apter or “Why The Sister-Sister Relationship Might Be The Hardest One of All” by Rebecca Seed. 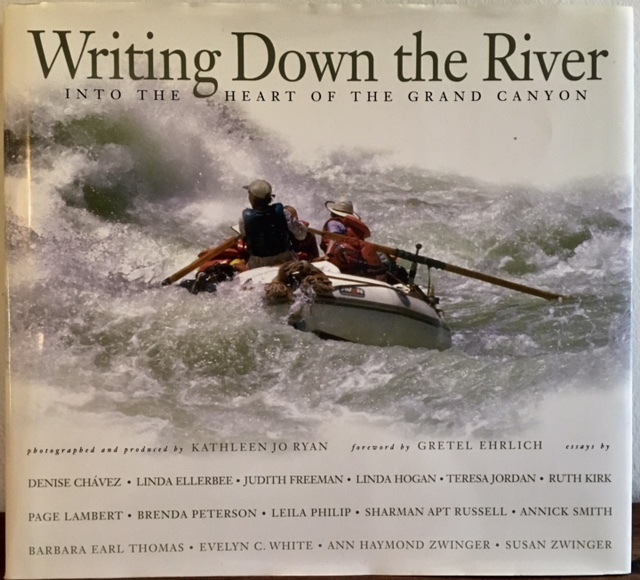 If you are a female writer with one or more sisters, these readings might be personally interesting as well as helpful in recognizing sister relationships that are unlike your own experience. 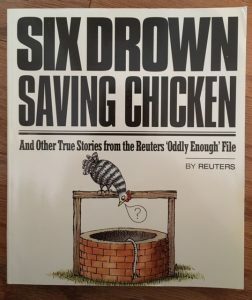 Why would a man want to read this stuff? Besides general interest in understanding human nature, one’s own wife, or daughters, if you are a writer, you will be better able to write female characters! 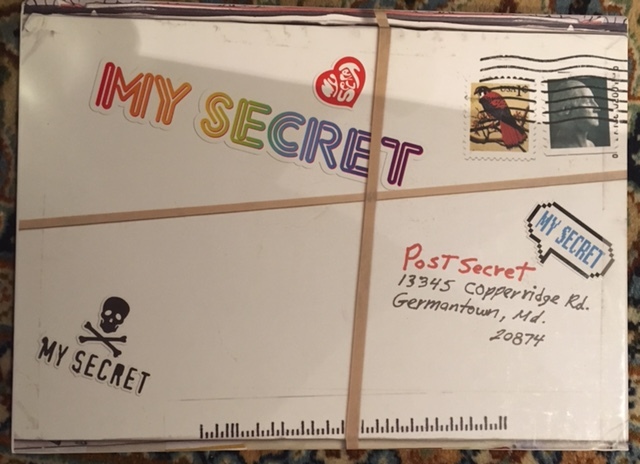 Everyone has secrets. 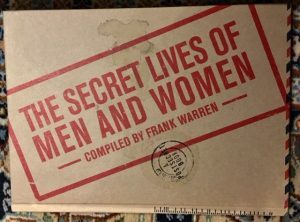 Anything that is known only to oneself (maybe one other person) is a secret. 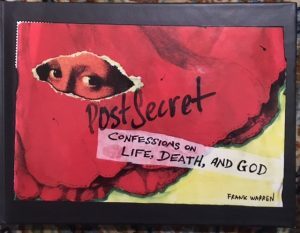 It can be a regret, betrayal, desire, fear, confession, past humiliation—anything unknown. Frank Warren tapped into the breadth and depth of secrets when he invited people to return postcards anonymously revealing a secret as part of a group art project. 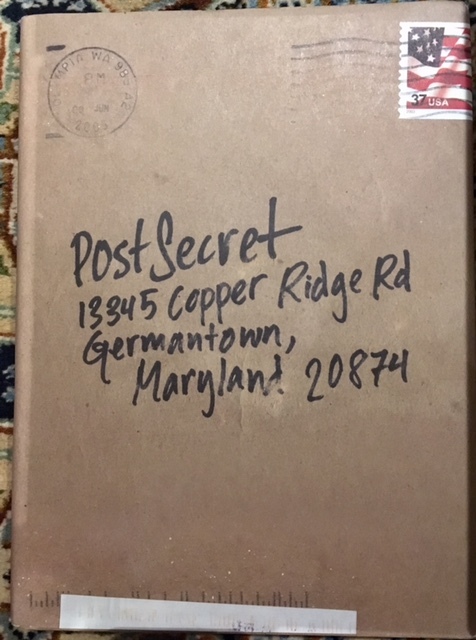 The response was extraordinary, and Post Secret became an international phenomenon—and a book. Here are three randomly selected offerings from this book. The art project ended but the postcards kept coming. 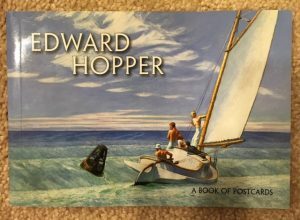 In two years he received over 50,000 postcards. 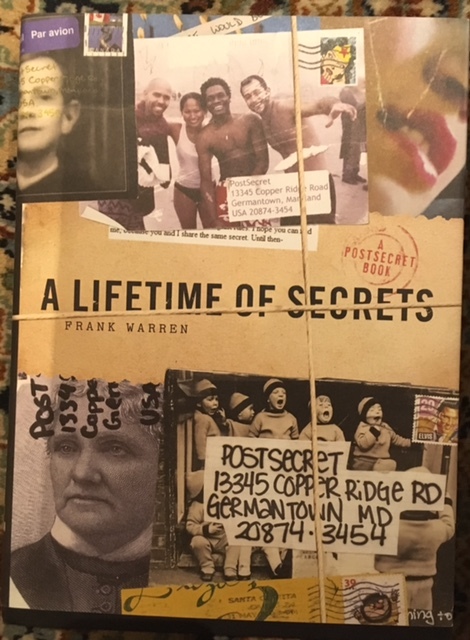 This led to a second book, containing many secrets shared by young people. Here are three examples. 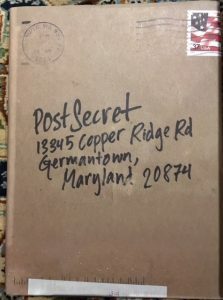 Why give your characters secrets? 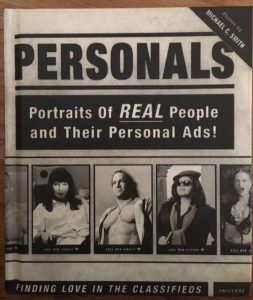 It adds depth to them, makes them more like real people. 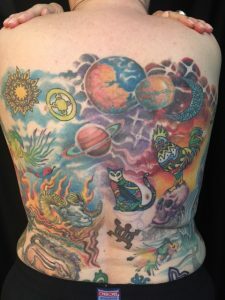 In addition, depending on the secret, it can add humor, intra-psychic tension, or the motivation for behavior in various situations. Feel free to give a character a secret of your own. Or make one up. 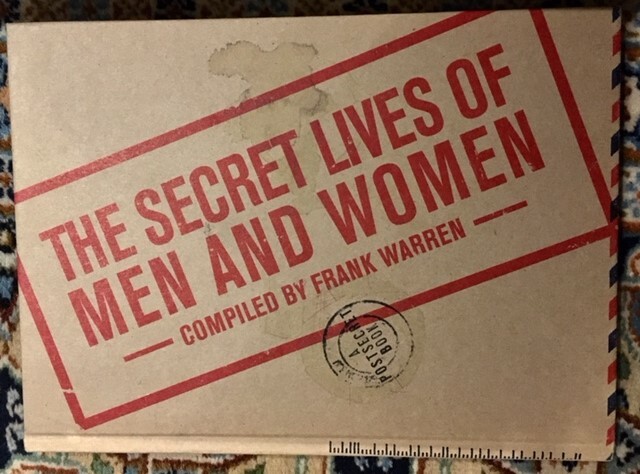 Or consult Frank Warren’s treasure troves! My personal adventures have been relatively tame: parasailing in the Bahamas, zip-lining in Costa Rica, draping an anaconda around my shoulders in the Amazon rainforest. (FYI: Anaconda poop bleaches clothing.) 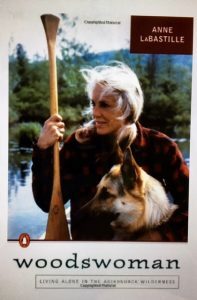 But I’ve always enjoyed vicarious adventures—women’s adventures. This started when I was in elementary school. 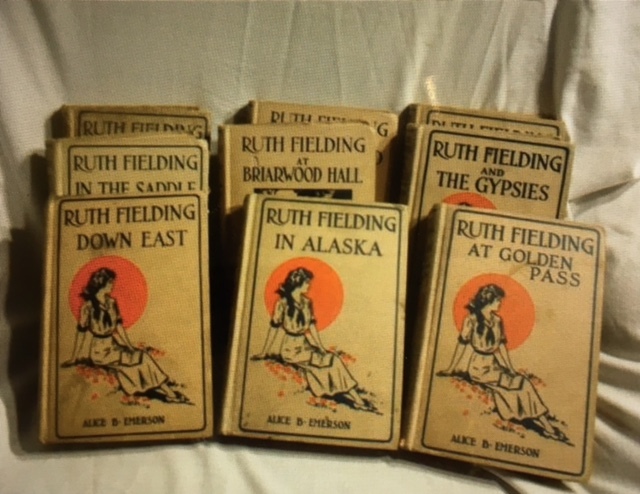 I read the adventures of Ruth Fielding in a series of books owned by my paternal aunt. 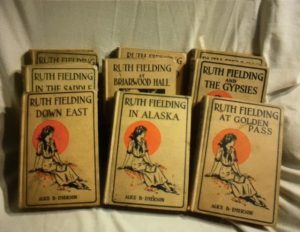 Although the settings of these thirty books seemed like ancient history (published 1913-1934), I loved kind-hearted, curious, brave, adventuresome Ruth. 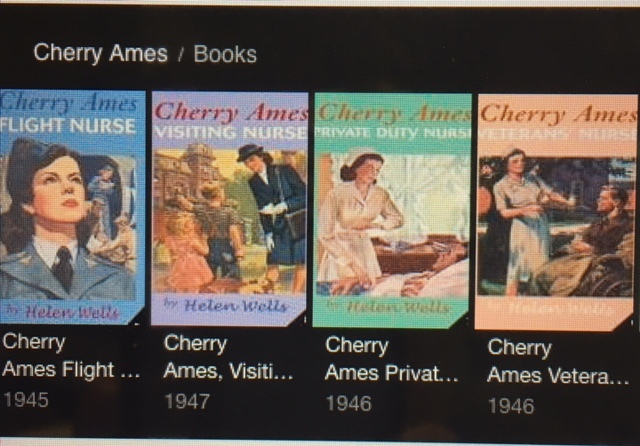 When I was somewhat older, I discovered Cherry Ames: Student Nurse. The medical aspects of this series (27 books) fascinated me. But more important was the heroine, whose kind heart led her into dangerous situations that her sharp wits got her out of. 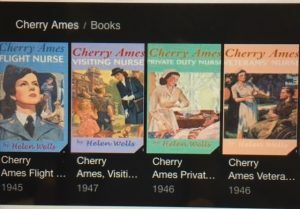 I gave my Cherry Ames books to my older granddaughter a few years ago, but alas, her interests are more in the fantasy/horror genre. Oh, well. As you may have gathered by now, for me, there is no expiration date on adventure. 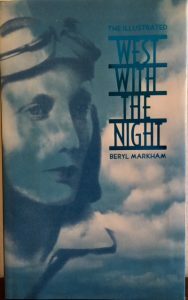 Beryl Markham’s incredible book is set in the earliest years of flight, and being a bush pilot in Africa. The writing is lyrical, the scenes compelling. 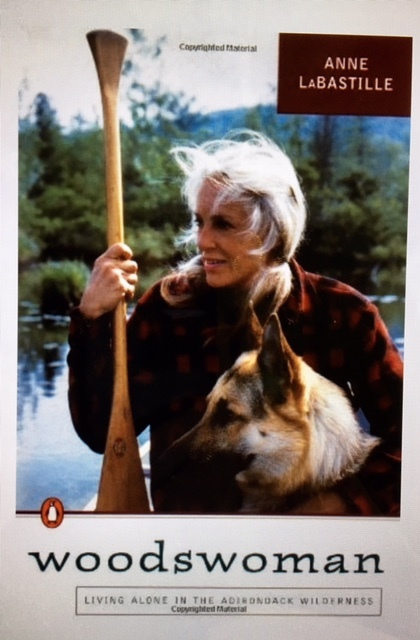 When I was involved in a vicarious love affair with Alaska (I’ve never been there), I read book after book set there, and through a rather circuitous route, came across Woodswoman. When one thinks New York, the first thing to come to mind is not wilderness. And yet the North Country has winters suitable for training military for the Arctic, and parts of the Adirondacks truly are isolated—and virtually inaccessible in winter. Anne LaBastille living alone, frozen in for the winter, with a jerry-rigged outdoor shower, is plenty adventurous. Bottom line: Find your adventure—personal or vicarious—and pursue it.